I was tagged by Ms. France girl Francine, kinda delayed but I’m making the most of it girl, thanks a bunch for this starve food tag, or what’s the perfect term to be used for this. Here's two of my comfort foods. 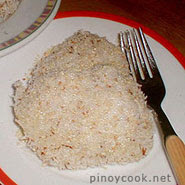 Palitaw as you all known, its a wheat and boiled in a hot water with white sugar and a grinned coconut. I prefer it this was than not using a grinned coconut. 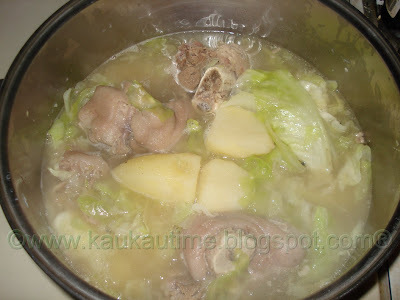 Nilagang Baboy [Boiled meat] with cabbage and potatoes on it. I can eat a lots when this is serve during meals. Let me pass this gracious comfort food tag to Daff, Sweetie_Texas, Michelle, Mabelle, Chari and Chalyza. lamia gud ani ba....tagai ko beh! gutom kaayo ko dah.